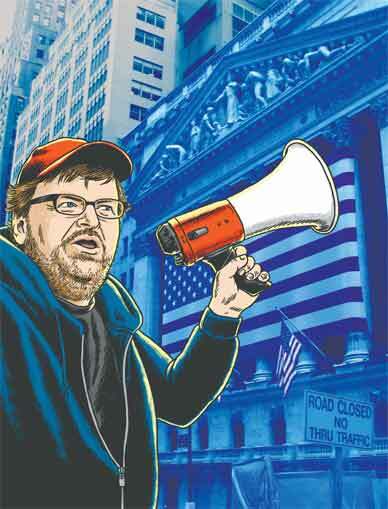 The Shock Doctrine author interviews Michael Moore on the roots of the economic crisis and the promise and peril of this political moment. So, the film is wonderful. Congratulations. It is, as many people have already heard, an unapologetic call for a revolt against capitalist madness. But the week it premiered, a very different kind of revolt was in the news: the so-called tea parties, seemingly a passionate defense of capitalism and against social programs. Meanwhile, we are not seeing too many signs of the hordes storming Wall Street. Personally, I’m hoping that your film is going to be the wake-up call and the catalyst for all of that changing. But I’m just wondering how you’re coping with this odd turn of events, these revolts for capitalism led by Glenn Beck. I don’t know if they’re so much revolts in favor of capitalism as they are being fueled by a couple of different agendas, one being the fact that a number of Americans still haven’t come to grips with the fact that there’s an African-American who is their leader. And I don’t think they like that. Do you see that as the main driving force for the tea parties? I think it’s one of the forces–but I think there’s a number of agendas at work here. The other agenda is the corporate agenda. The healthcare companies and other corporate concerns are helping to pull together what seems like a spontaneous outpouring of citizen anger. But the third part of this is–and this is what I really have always admired about the right wing: they are organized, they are dedicated, they are up at the crack of dawn fighting their fight. And on our side, I don’t really see that kind of commitment. When they were showing up at the town-hall meetings in August–those meetings are open to everyone. So where are the people from our side? And then I thought, Wow, it’s August. You ever try to organize anything on the left in August? Wasn’t part of it also, though, that the left, or progressives, or whatever you want to call them, have been in something of a state of disarray with regard to the Obama administration–that most people favor universal healthcare, but they couldn’t rally behind it because it wasn’t on the table? Yes. And that’s why Obama keeps turning around and looking for the millions behind him, supporting him, and there’s nobody even standing there, because he chose to take a half measure instead of the full measure that needed to happen. Had he taken the full measure–true single-payer, universal healthcare–I think he’d have millions out there backing him up. Now that the Baucus plan is going down in flames, do you think there’s another window to put universal healthcare on the table? Yes. And we need people to articulate the message and get out in front of this and lead it. You know, there’s close to a hundred Democrats in Congress who had already signed on as co-signers to John Conyers’s bill. Coming back to Wall Street, I want to talk a little bit more about this strange moment that we’re in, where the rage that was directed at Wall Street, what was being directed at AIG executives when people were showing up in their driveways–I don’t know what happened to that. I don’t think that is what has happened. I’m not so sure they’re the same people. And I think that those things that he believes in are still there. Now, it’s kind of up to him. If he’s going to listen to the Rubins and the Geithners and the Summerses, you and I lose. And a lot of people who have gotten involved, many of them for the first time, won’t get involved again. He will have done more to destroy what needs to happen in this country in terms of people participating in their democracy. So I hope he understands the burden that he’s carrying and does the right thing. Well, I want to push you a little bit on this, because I understand what you’re saying about the way he’s lived his life and certainly the character he appears to have. But he is the person who appointed Summers and Geithner, who you’re very appropriately hard on in the film. And one year later, he hasn’t reined in Wall Street. He reappointed Bernanke. He’s not just appointed Summers but has given him an unprecedented degree of power for a mere economic adviser. And meets with him every morning. Exactly. So what I worry about is this idea that we’re always psychoanalyzing Obama, and the feeling I often hear from people is that he’s being duped by these guys. But these are his choices, and so why not judge him on his actions and really say, “This is on him, not on them”? I agree. I don’t think he is being duped by them; I think he’s smarter than all of them. When he first appointed them I had just finished interviewing a bank robber who didn’t make it into the film, but he is a bank robber who is hired by the big banks to advise them on how to avoid bank robberies. And now it turns out they were just being brought in to keep stealing. Right. So now it’s on him. All right. Let’s talk about the film some more. I saw you on Leno, and I was struck that one of his first questions to you was this objection–that it’s greed that’s evil, not capitalism. And this is something that I hear a lot–this idea that greed or corruption is somehow an aberration from the logic of capitalism rather than the engine and the centerpiece of capitalism. And I think that that’s probably something you’re already hearing about the terrific sequence in the film about those corrupt Pennsylvania judges who were sending kids to private prison and getting kickbacks. I think people would say, That’s not capitalism, that’s corruption. Well, people want to believe that it’s not the economic system that’s at the core of all this. You know, it’s just a few bad eggs. But the fact of the matter is that, as I said to Jay [Leno], capitalism is the legalization of this greed. Greed has been with human beings forever. We have a number of things in our species that you would call the dark side, and greed is one of them. If you don’t put certain structures in place or restrictions on those parts of our being that come from that dark place, then it gets out of control. Capitalism does the opposite of that. It not only doesn’t really put any structure or restriction on it. It encourages it, it rewards it. And I realized that [because] we no longer teach economics in high school, they don’t really understand what any of it means. The point is that when you have capitalism, capitalism encourages you to think of ways to make money or to make more money. And the judges never could have gotten the kickbacks had the county not privatized the juvenile hall. But because there’s been this big push in the past twenty or thirty years to privatize government services, take it out of our hands, put it in the hands of people whose only concern is their fiduciary responsibility to their shareholders or to their own pockets, it has messed everything up. The thing that I found most exciting in the film is that you make a very convincing pitch for democratically run workplaces as the alternative to this kind of loot-and-leave capitalism. So I’m just wondering, as you’re traveling around, are you seeing any momentum out there for this idea? People love this part of the film. I’ve been kind of surprised because I thought people aren’t maybe going to understand this or it seems too hippie-dippy–but it really has resonated in the audiences that I’ve seen it with. But, of course, I’ve pitched it as a patriotic thing to do. So if you believe in democracy, democracy can’t be being able to vote every two or four years. It has to be every part of every day of your life. We’ve changed relationships and institutions around quite considerably because we’ve decided democracy is a better way to do it. Two hundred years ago you had to ask a woman’s father for permission to marry her, and then once the marriage happened, the man was calling all the shots. And legally, women couldn’t own property and things like that. Thanks to the women’s movement of the ’60s and ’70s, this idea was introduced to that relationship–that both people are equal and both people should have a say. And I think we’re better off as a result of introducing democracy into an institution like marriage. Truly they’re going to laugh at us the way we laugh at people 150 years ago who put leeches on people’s bodies to cure them. It is one of those ideas that keeps coming up. At various points in history it’s been an enormously popular idea. It is actually what people wanted in the former Soviet Union instead of the Wild West sort of mafia capitalism that they ended up with. And what people wanted in Poland in 1989 when they voted for Solidarity was for their state-owned companies to be turned into democratically run workplaces, not to be privatized and looted. But one of the biggest barriers I’ve found in my research around worker cooperatives is not just government and companies being resistant to it but actually unions as well. Obviously there are exceptions, like the union in your film, United Electrical Workers, which was really open to the idea of the Republic Windows & Doors factory being turned into a cooperative, if that’s what the workers wanted. But in most cases, particularly with larger unions, they have their script, and when a factory is being closed down their job is to get a big payout–as big a payout as they can, as big a severance package as they can for the workers. And they have a dynamic that is in place, which is that the powerful ones, the decision-makers, are the owners. You had your US premiere at the AFL-CIO convention. How are you finding labor leadership in relation to this idea? Are they open to it, or are you hearing, “Well, this isn’t really workable”? Because I know you’ve also written about the idea that some of the auto plant factories or auto parts factories that are being closed down could be turned into factories producing subway cars, for instance. The unions would need to champion that idea for it to work. I sat there in the theater the other night with about 1,500 delegates of the AFL-CIO convention, and I was a little nervous as we got near that part of the film, and I was worried that it was going to get a little quiet in there. Just the opposite. They cheered it. A couple people shouted out, “Right on!” “Absolutely!” I think that unions at this point have been so beaten down, they’re open to some new thinking and some new ideas. And I was very encouraged to see that. The next day at the convention the AFL-CIO passed a resolution supporting single-payer healthcare. I thought, Wow, you know? Things are changing. Coming back to what we were talking about a little earlier, about people’s inability to understand basic economic theory: in your film you have this great scene where you can’t get anybody, no matter how educated they are, to explain what a derivative is. So it isn’t just about basic education. It’s that complexity is being used as a weapon against democratic control over the economy. This was Greenspan’s argument–that derivatives were so complicated that lawmakers couldn’t regulate them. It’s almost as if there needs to be a movement toward simplicity in economics or in financial affairs, which is something that Elizabeth Warren, the chief bailout watchdog for Congress, has been talking about in terms of the need to simplify people’s relationships with lenders. So I’m wondering what you think about that. Also, this isn’t really much of a question, but isn’t Elizabeth Warren sort of incredible? She’s kind of like the anti-Summers. It’s enough to give you hope, that she exists. Absolutely. And can I suggest a presidential ticket for 2016 or 2012 if Obama fails us? [Ohio Congresswoman] Marcy Kaptur and Elizabeth Warren. I love it. They really are the heroes of your film. I would vote for that. I was thinking about what to call this piece, and what I’m going to suggest to my editor is “America’s Teacher,” because the film is this incredible piece of old-style popular education. One of the things that my colleague at The Nation Bill Greider talks about is that we don’t do this kind of popular education anymore, that unions used to have budgets to do this kind of thing for their members, to just unpack economic theory and what’s going on in the world and make it accessible. I know you see yourself as an entertainer, but I’m wondering, do you also see yourself as a teacher? I’m honored that you would use such a term. I like teachers.